Every so often PlayStation Plus delivers a real unexpected treat. This usually involves a game that you’ve never heard of before and would unlikely pick up given the choice, unexpectedly downloading onto your console. Then, it is just there, sitting on the hub screen taunting you to give it a go, no matter the daft title, silly sub-genre or modest developer name (Hyper Awesome Entertainment, take a bow). Dungeon Punks, with which I have recently become accustomed, just happens to be one of these little gems. Let’s get some necessary b*llocks out of the way first. Despite the title, there is a major absence of dungeons in Dungeon Punks. Indeed, most of the scenarios are set outdoors. In daylight. Furthermore, calling bog-standard fantasy creatures ‘Punks’ is a little on the peculiar side. They are very un-punky and more straight-laced D&D caricatures. 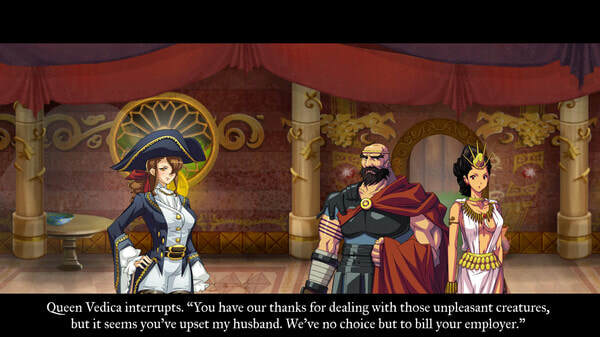 Last of all, the described genre of ‘tag-team brawler RPG’ does not really give a true sense of the game dynamics. Other than choosing a particular character that is more greatly aligned to either a strength, magic or resistance skill-set and selecting the weapon and shield they can use, Dungeon Punks has f*ck all to do with role-playing. Not that these fibs are in anyway detrimental to the quality content. If anything, they just add to the bizarre (yet ingenious) plotting and the totally out of place Japanese stylings of the cut-scenes. So, while you’re not getting a ponderous dungeon-crawling rouge-like game (as the title would otherwise suggest), you are in fact getting a sublime, fast-paced, sometimes silly, old-school styled beat ‘em up fit for the modern age. I can't explain why an airship, but an airship it is. Thus, fans of the Golden Axes, Final Fights, Streets of Rages and Knights of the Rounds from yester-year will pretty much lap-up Dungeon Punks. It is quite simple to pick up and play on this basis. Select one of six characters and start mashing up the enemies that get in the way of your objective, which starts off with your incompetence as parcel delivery men and ends up with saving the world from Rezcorp’s undead resurrection plague. It features three-player local co-op play, although the absence of other players means that computer A.I. will control the other two ‘punks’. The tag-team element is a neat addition, allowing characters to flip in and out of the action to use there different skills and magic against the ensuing hordes of monsters. Likewise the controls are fairly straightforward and replicate the ease of appeal that was a feature of arcade beat-em ups: one button for magic use, one to strike opponents, one to block. No need to over-complicate things with the magnitude of the PlayStation controller. 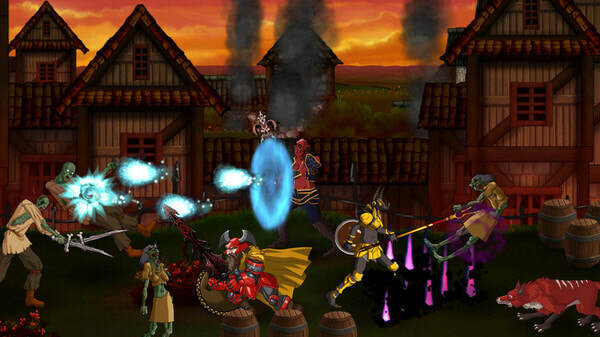 Dungeon Punks does benefit from not being totally alike the coin-ops of old though. 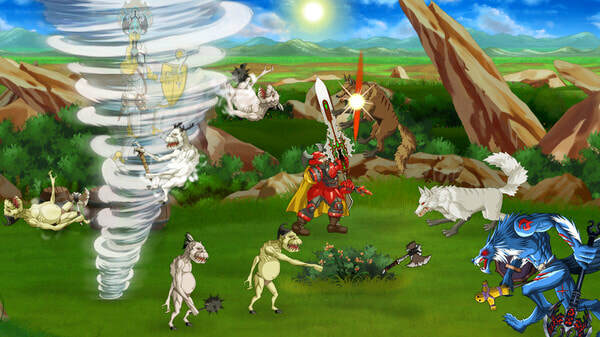 For instance, it’s not a straightforward side-scrolling beat-em-up. Instead, the combat is managed in a largely self-contained screen with new monsters populating in the scenario once the initial welcoming committee have been dispatched. Once several waves of minions are cleared there is an element of choose your own pathway, similar to how progress is made in Smash TV, as different routes to the boss of each stage open up. The weak RPG aspects also have enough variation to provide a unique feel. There are one or two side-quests per stage, which add bonus cash and experience points if you decide to tackle them. Furthermore, weapon drops are frequent, featuring the now over-familiar blue (magic), yellow (rare) and orange (legendary) statuses, useful for increasing your ability to smash the crap out of stuff quicker. Likewise, experience points matter, as different monsters have an equal, greater or lesser degree of hit points depending on your experience. This means that ploughing your way from one stage to the next is unlikely; a little bit of grinding is required to level sufficiently to get through each stage. This gives Dungeon Punks some much-needed longevity, something not always associated with old school beat ‘em ups. The real bonus here is that the grinding is not onerous and progress is always possible, even if it simply involves moving onto the next battle-screen. 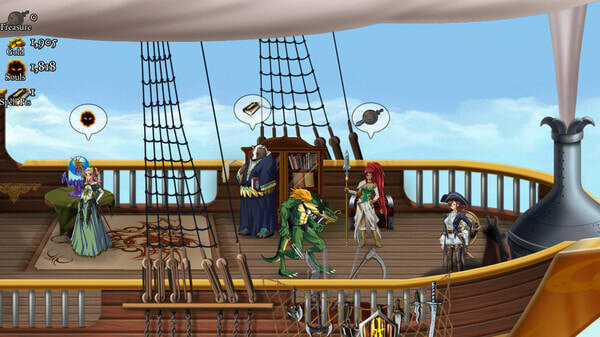 The assured purchase of a meatier weapon, more protective shield or increased spell-power from Captain Firelle’s band of misfits on your homely airship base certainly help with matters here. Even then, however, enemies are not a push-over, mostly because there are so many of the buggers on screen at any one time. The swines also have fiendish variations in their attack patterns, which makes for a little earnest strategy required on your part. Just mashing the attack button is a sure fire way of getting your arse handed to you. This is particularly the case with the skeletons near the end game, as the f*ckers are downright sneaky with their uncanny ability to block your attacks. I had to shout at the TV to do one on numerous occasions to avoid the ignominy of a rage quit! One of many amusing cut-scenes. 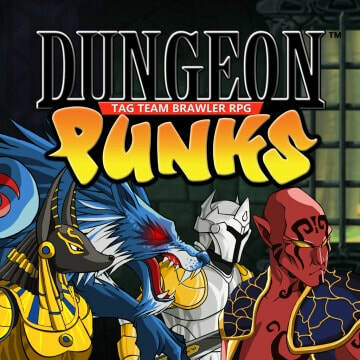 Dungeon Punks is, therefore, suitably tough and will certainly test your beat ‘em up know-how. Luckily, there is some solace in the placement of ‘exits’ across each level which act as a handy escape route back to the airship once things start getting a little too beastly. Using an exit means restarting at the beginning of the current stage though, albeit with the opportunity to substantially buff your characters at the airship shop before the next onslaught. Added to the more-ish gameplay are some lovely visuals and audio. The graphics are big, bold, colourful and quick. It’s particularly impressive when there is a host of action going on. The various magical set-pieces, by both you and the bad guys, stand out and any game featuring old-school parallax scrolling is deserving of a double fist-pump. Enemy variety is also impressive, with character models equally well designed as the selection of heroes. Things do get slightly odd with the cut-screens between each stage, where the graphical style converts to a somewhat out of place JRPG imagery. However, with the ridiculous plot that links each stage, you soon get the picture that Hyper Awesome have made this intentionally wacky. Indeed, accidentally killing the wrong fire-demon burning down a village, and p*ssing off the King for murdering his pet big-bird turn-out to be quite chucklesome. Along with the pleasantly accompanying in-game tunes (nothing outstanding, but nothing that grates either) this actually adds to the overall charm. ​"So, while you’re not getting a ponderous dungeon-crawling rouge-like game (as the title would otherwise suggest), you are in fact getting a sublime, fast-paced, sometimes silly, old-school styled beat 'em up fit for the modern age"